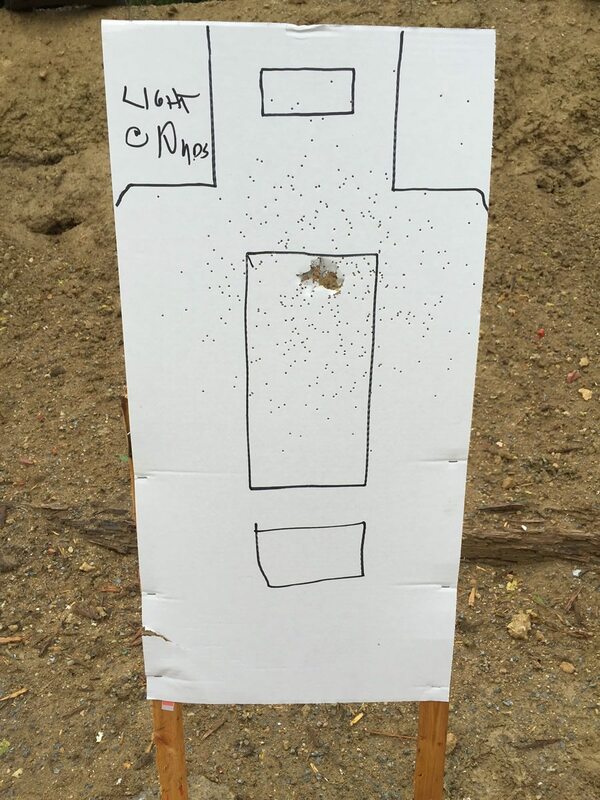 Shooting Review: The Kel-Tec KSG | Eagle Gun Range Inc. 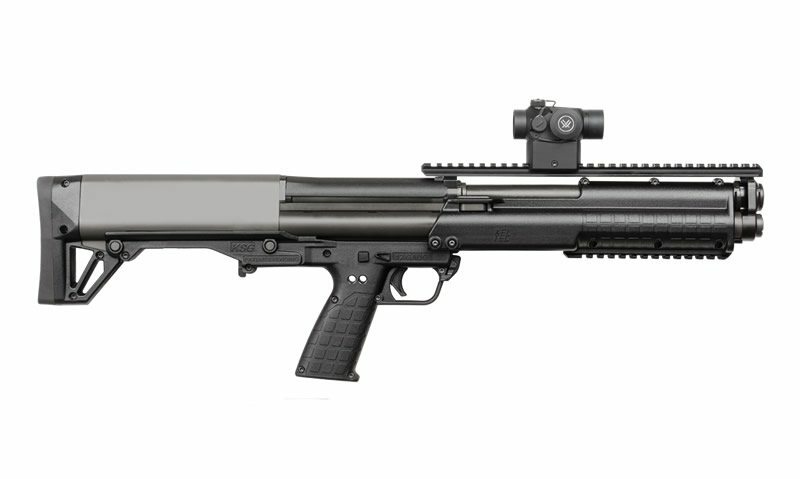 The KSG is the double-tube magazine, bullpup-design, tactical shotgun from Kel-Tec. A pump-action shotgun, the KSG’s chambering is 12-gauge and it takes up to 3” shells. The KSG’s design is unique and striking, with clever attention paid to both function and efficiency in the overall design. I recently spent some time with the KSG and found a lot to like. Here are some of my thoughts from the experience. Why Consider the Kel-Tec KSG? The KSG is the redefinition of a self-defense shotgun and is purpose made for CQB (close-quarters combat) and more tactical situations. Its small size makes it eminently portable and maneuverable in tight quarters (like the hallways and furnished rooms of a home), making it a formidable home-defense gun, especially since there are various indoor-safe defense loads to consider. With the two separate magazine tubes and a mechanism to quickly switch between them, the KSG becomes an adaptable weapon for fluid tactics and/or varied ranges where different loads are optimal. Also, the KSG comes equipped with upper and lower picatinny rails, ready to accept iron sights, an optic, flashlight, vertical grip (recommended), or whatever accessory fits your desire. 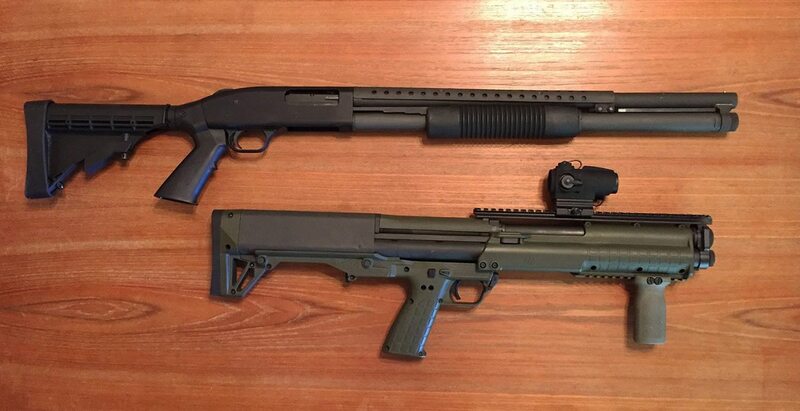 Here is the KSG next to a Mossberg 500A Tactical 12 gauge, for size and component comparison. I confess I’ve wanted to get my hands on the KSG since before it was released. Over the past few months I’ve seen videos of the KSG malfunctioning in various ways, generally related to feeding—and others apparently debunking any such inherent problems—so I had some trepidation. This is the first time I’ve had the opportunity to shoot this interesting shotgun and, in this case, it did not disappoint. I received the KSG with a Sightmark Wolverine CSR red dot optic mounted and I put a Blue Force Gear padded Vicker’s sling on the gun. As a carbine shooter, I immediately warmed up to the size and maneuverability of the KSG. With the shotgun slung, it rode, felt, and handled in a way very similar to a short-barreled rifle carbine. I’ve seen footage of some people having trouble with the KSG feeding shells, but I had no such issues. As I understand it, this issue was something perhaps related to the earliest models that were shipped. This shotgun does want you to be very firm in your manipulation of the pump action, though. If you weak-arm the pump, it can hang or fail to cycle properly. But this is a user issue and not a function flaw, so far as I can tell. 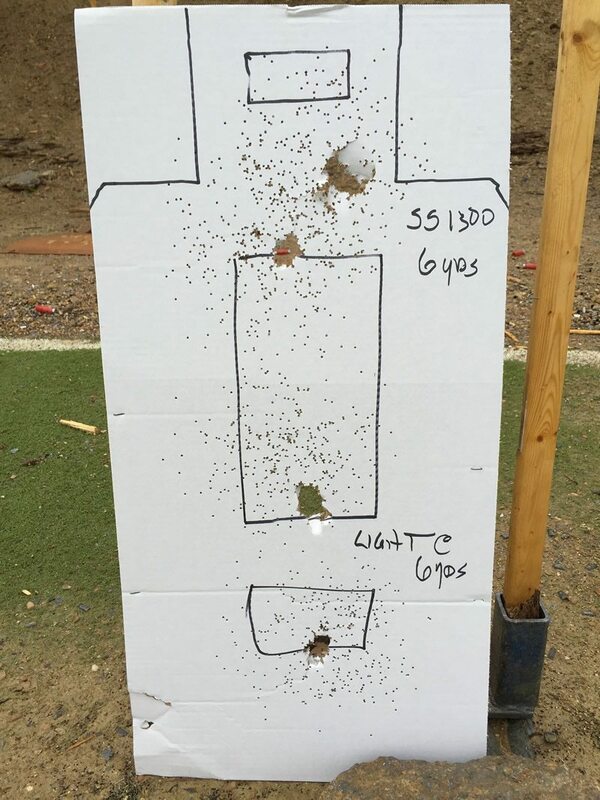 The weight of the KSG is almost exactly the same as for my Mossberg 500A Tactical, which I shot side-by-side with the KSG, so the recoil felt identical. I found it quite comfortable to hold and to cheek weld while firing, and the red-dot optic turned out to be an effective and easy-to-use solution for sighting with the KSG. …all of which it fed without complaint or issue. As a side note, the Nitro Magnum shells provided a stunning kick when firing. After a box of those, my shoulder was in need of a couple days rest! The KSG is somewhat oddly shaped and looks a little blocky. Even so, holding and engaging with it doesn’t seem odd or uncomfortable at all. Quite the contrary, actually. Loading the shotgun can be uncomfortable, though. The mechanics around the magazine tubes are a bit pointy and my fingers tended to rub against them from time to time while loading shells into the tubes. I have seen videos and have read reports that there can be a problem with the downward-ejection of the empty shells impacting and even abrading the shooter’s wrist. I found no such problems and never even once noticed the ejection. I did all shooting in a short-sleeved shirt and no gloves, so my hand and wrist and arm were fully exposed. Never felt a thing, either while standing static or while maneuvering and firing. As mentioned earlier, the recoil is no worse (and no better) than with an ordinary shotgun of similar weight, despite the comparatively small size of the KSG. I used the KSG while maneuvering over terrain and while engaging targets at various points in a 90-degree arc and never had trouble acquiring or holding on targets for multiple shots. So I found no controllability issues. With two magazine tubes and, on average, a capacity of 14 +1 rounds, the KSG has darned good capacity! Though, I have to say, I always ran out of rounds sooner than I wanted to. This thing is fun to shoot and once you get started, it’s disappointing to have to stop. I found the controls on the KSG to be well placed. The pump release is forward of the trigger guard and accessible from either side. I had no trouble reaching it with my index finger and medium-sized hands. The safety is well located, but I found the push-button control to be a bit clumsy. I had no trouble engaging it with my strong-hand thumb or index finger, but the action is in no way intuitive. I never got used to it and always had to look at it to remind myself if was engaged or disengaged. The Kel-Tec KSG comes with two picatinny rails. 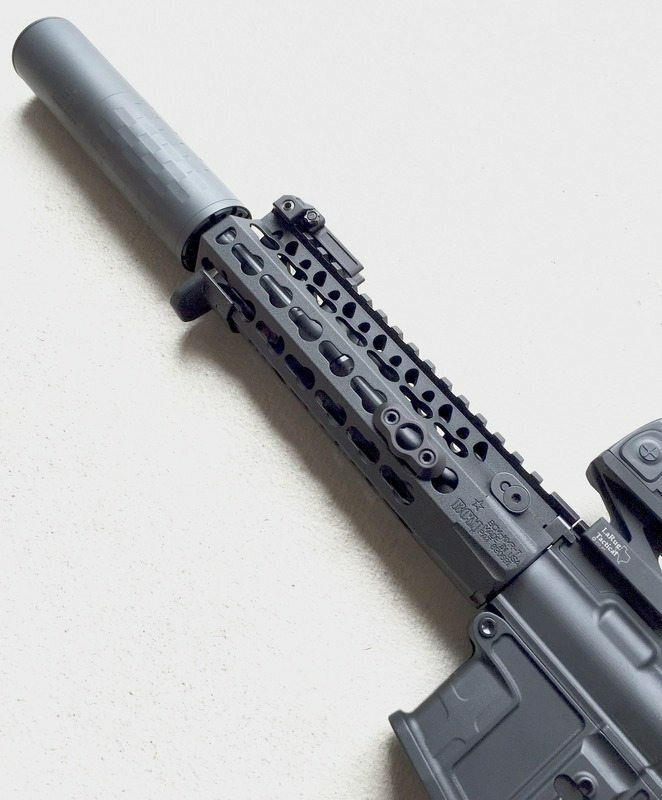 There is a 12” 1913 mil-spec rail on top for sights and optics and a 6” polymer rail on the bottom for a vertical grip and/or flashlight or other accessory. I ran mine with a Sightmark Wolverine red dot on top and really enjoyed it. There is a steel sling mount up near the muzzle and strap vents in the stock for your sling; and this shotgun seems to work very well with a sling! The proximity of the forward sling mount to the muzzle means you’ll have to be aware of where your sling is, as a lose loop could conceivably move in front of the dangerous end. Switching between the two magazine tubes is accomplished by actuating the selector lever on the underside behind the grip. The lever is quite small, but I found it to work just fine. Even so there’s an aftermarket extended selector lever available to make this lever easier to find and engage. Fieldstripping the KSG is by all accounts very easy (I did not try it) and accomplished simply by removing two pins. As shotguns go, this is one heckuva compact, wieldy, quickly employable, close-quarters defense weapon. The size and weight make it a breeze to manipulate. The picatinny rails allow you to set it up in proper CQB fashion. The downward ejection keeps your profile low and, along with the ambi controls, allows for easy use by righties and lefties. And the magazine capacity is exceptionally nice. I’m having trouble coming up with strikes against this bullpup shotgun. 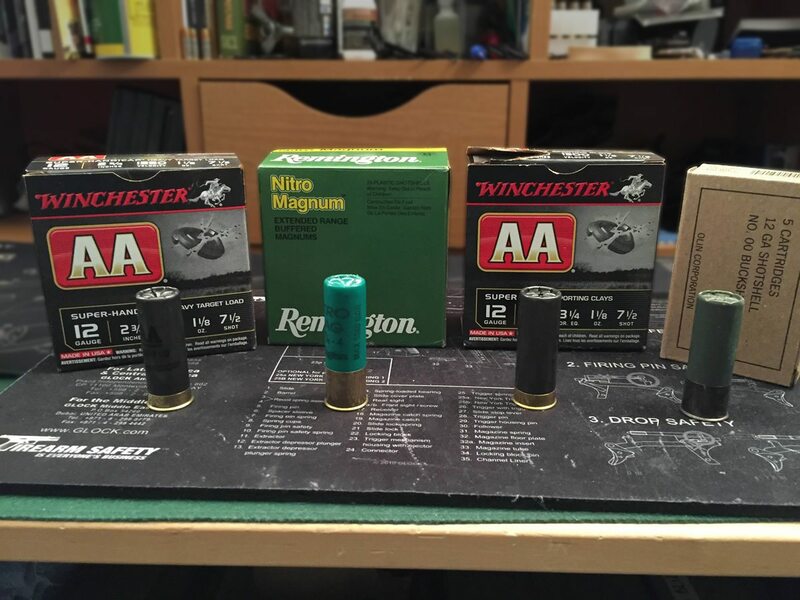 There are nitpicky things, like the possibility of scraping your fingers while loading shells or the odd safety controls action, or having to turn the gun upside down to check the chamber, but these are minor issues. Looks strange, feels great, and moves great. The KSG fit me just fine. This is an easy-to-shoot shotgun. With iron sights and/or a red-dot optic, it’s very point-and-click. I must say that a vertical grip on the pump rail adds to the ease of function and is otherwise highly recommended (for safety reasons). 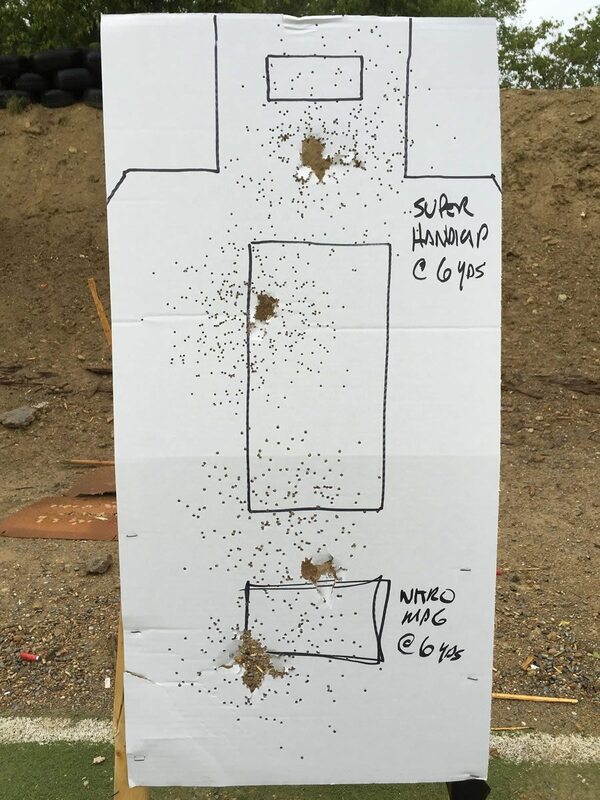 Scoring here strictly based on my experience, other than one minor cycling hiccup when I soft-armed the pump (totally my fault), the KSG ran like a sewing machine. I’m entirely confident in the function of this shotgun, but note that I put less than 200 rounds through it. The Kel-Tec KSG has a clever and truly revolutionary design that works very well. After spending time examining and shooting it, in my estimation the KSG is the absolute best shotgun for CQB, tactical needs and self-defense; perhaps even one of the best overall self-defense and tactical weapons going. It is likely that improvements can be made to the design and perhaps even the function, but I perceive no grave flaws with it and the design and function foundation is solid. 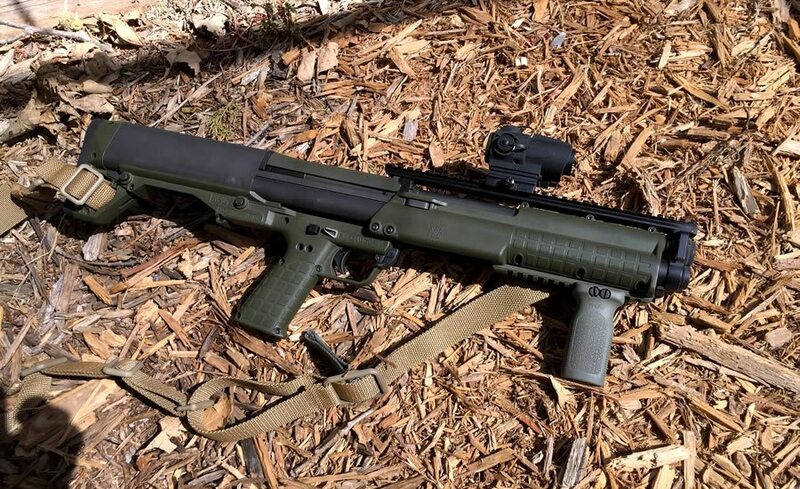 I highly recommend the KSG to anyone interested in a tactical shotgun. If you drop by Eagle Gun Range, be sure to rent it and take it for a spin. I bet you’ll find it hard to put down. With mine they function great and it added to the capacity. Did you ever worry about you hand being too close to the end of the barrel and possibly slipping into harms way? I never did. Perhaps part of that was the fact that I had a nice vertical grip up there to hold onto, but I’ve shot these w/o that device and I felt pretty confident. Given the choice, I’d always opt for some sort of handstop up front. How strong do you have to be to pull back the pump rail to get a round into place? As the proverbial little old lady with a racoon problem, I’m not sure I would be able to pull it back, without using two hands and bracing it end of the barrel with my feet, kind of like a crossbow.